On our previous trip to Ethiopia, we invited the owners of Ariti – a long-running herbal production company in Addis Ababa – to visit the Fiche medicinal garden. Chemists Ermias Dagne and Tadelech Tadesse established Ariti almost 20 years ago, and today, run the business with their daughters Dina and Beza. Ermias is a professor of organic chemistry at Addis Ababa University and also director of the African Laboratory of Natural Products (ALNAP). Their company is well-known in town for beautiful essential oils of frankincense, eucalyptus, cinnamon and lemongrass; natural lotions, herbal teas and tinctures for everything from cold and flu to radiant skin. We hoped Ariti might be able to share some wisdom with the Etse Fewus Association about how to process their herbs – and that there could be potential for some kind of partnership into the future. We were so pleased they were able to join us on an early morning drive out to Fiche. After a tour of the garden – wild and dry outside of the rainy season, and peppered with tiny white African jasmine – we found ourselves sitting with the Etse Fewus members inside their thatched guardhouse for a tea tasting. “When we make friends in Ethiopia, we always invite them in for coffee: ‘Nu buna tetu’,” Ermias told us. “But I’m an unusual Ethiopian,” he said, taking a handful of chopped lemongrass to throw into a pot of water Shikerke had boiling on hot coals. As we cradled our own warm cups, the guardhouse filled with fragrant lemongrass steam and the heady oils of crushed eucalyptus leaves, ceremoniously laid to cover the mud floor underfoot. We were passed traditional dubbo (bread) with black cumin, honey from the garden and sugared popcorn as Ermias and Tadelech showed the Association more samples of various herbal teas, oils and lotions they’d brought with them from Addis. Etse Fewus members told the story of their garden, of the local herbs and how they are used for common ailments in this region. And the women shared some of their own herbal tea recipes – combinations of wild thyme, dried garlic, tenadam, mint and damakase. Tadelech spoke about how to clean and dry herbs for market – and how to save and store valuable seeds. And she and Ermias floated the idea of sourcing herbs from the group for their shops in Addis. While they have their own garden there, Ariti also work with small growers and cooperatives all over Ethiopia to gather the various plants and resins for their products. Tadelech showing the Association samples of Ariti herbal products. The Etse Fewus garden is not big enough – and still too dependent on regular rainfall – to provide a large supply on its own. But Ermias and Tadelech suggested contracting the job to the wider community, who could grow herbs in their own gardens and source wild plants from the surrounding area. Thyme, often used for respiratory problems and hypertension, is one such herb that grows happily on the rocky, exposed ledges of this highland region. Certain types of Aloe are also found high and wild in Fiche – as is Chikugn, used for eye infections and psychiatric conditions. Almost a year on, we had an appointment with Gule from Etse Fewus and Dina from Ariti at a busy café in Addis. Gule had brought a bag full of chamomile flowers, the harvest from seeds Ariti had supplied for the group to cultivate five months prior. The flowers were fresh and fragrant, but the yield was small: Even though the seeds had grown well, livestock had eaten all the plants in the other members’ compounds, Gule told us. “It is something; we can’t sell much of this, but it is a start and hopefully we can learn from it,” said Dina, adding that Ariti would be prepared to pay 50 birr/ kilo for the chamomile, much more than the going price for teff, Ethiopia’s staple grain, at about 30 birr. Gule with chamomile flowers; cultivated by the Association from seeds provided by Ariti Herbal. The best-quality chamomile flowers will be packaged as tea by Ariti Herbal. Gule had also brought samples of kitkita, used against malaria, and branches of endod berries, a beautiful natural soap for washing and brightening clothes. Ariti have plans to develop a line of endemic medicinal herbal products and they hope Etse Fewus can play a role in providing some of the raw herbs. “We really want to support this group and hopefully we can work more with them in the future to promote these plants – but it will be step-by-step,” said Dina. We hope, that with some business skills and permaculture training already under their belts, they will be able to make it happen. Together with their herbal honey operation, Etse Fewus’ ability to nurture such a market for their medicinal plants will be critical for the future of the communal garden – and ultimately – the conservation of some of their most precious natural resources. Our very own Lizzie d’Avigdor spoke on Ethiopian radio recently about her research, biodiversity and the development of the Botanica Ethiopia project in Fiche. From household gardens to a flourishing community ‘pharmacy’ of medicinal herbs, hear how a group of passionate home herbalists are documenting and preserving Ethiopia’s precious healing plants for future generations. The hives arrive: Workalemahu and Etse Fewus members check out the new equipment in Fiche. In Fiche, many women make tella beer or areke, a spirit similar to Italian grappa, to supplement the family income. While caring for young children, tending the home and family land, they will boil and ferment barley and teff grain, gesho (local hops), kosso and other herbs in huge clay pots to make the traditional drinks for the tella houses in town. As well as being popular beverages, tella and arake are often administered medicinally or in combination with certain herbs to treat upset stomachs, worms or fever. When Etse-Fewus ‘Healing Herbs’ Association members were asked recently ‘Who makes the best tella in town?’ – the answer was unanimous: A woman named Beletech is famous for her brew. 76-year-old Ato Abe, one of the group leaders and a respected local herbalist, confirmed he had sampled all the tella in Fiche. The discussion was part of a five day basic business skills course we organised in January with Ethiopian micro-enterprise organisation Women in Self Employment (WISE). Etse-Fewus members completed a basic business skills course in Fiche with Ethiopian micro-enterprise organisation WISE. Some time ago, the Etse Fewus cooperative put to us the idea of bringing bees to their medicinal herb garden in Fiche. A healthy swarm could help pollinate the herbs, they said, and provide an important extra source of income for members and their families. Ethiopia is a country with a long tradition of beekeeping and some of the group already owned a few traditional beehives or ‘kafo’: long, cylindrical baskets, usually made of eucalyptus twigs, mud, woven bamboo and false banana leaves. Members said they would combine their old Kafos at the garden site if Botanica Ethiopia could help them obtain some modern beehives. The new, more expensive box hives would yield better quality honey – and much more of it. We loved the idea and so were excited this week to be able to deliver the first batch of brightly-painted modern hives to Gule and Werkalemahu at the garden. A living pharmacy in Fiche — Botanica Ethiopia, 2015 from May Slater on Vimeo. High above the Jemma River, three hours from Addis Ababa, we walk a rocky path between houses made of mud and young eucalypts. Gule, one of the founding members of the Etse Fewus ‘Healing Plants’ association is leading us off-road to the medicinal garden. We pass resting donkeys and loops of white cotton, hung up to dry outside people’s homes. It feels closer to the sun in Fiche and at lunchtime, everything looks dusty and heat-struck. Everything, except a group of women coming up the path behind us, who are laughing into white gabis flicked over their heads against the heat. We realise it’s the Etse Fewus women and their children, and it’s big greetings and more laughter on the road. The Sunday market was packing up for the day and they’d left to find us on the ridge above town. We walk together until our little path opens up to yellowed farmland where a family and their cows are threshing newly cut teff. Below them, neatly fenced, is the garden we’d started three years before. Thanks to all who supported the Botanica Ethiopia team at the Blackmores Sydney Running Festival recently. This time we joined 34,000 runners across beautiful Sydney Harbour Bridge to raise money for the Living Pharmacy project in Fiche. And thanks to you, we raised more than $500! Special gratitude to Kerrie Carroll, Will Birkett, Kathryn Lee, Andrew Key and Darrien Wise for your generous donations. And a special mention of Cameron Wise for his stellar, somewhat surprising performance on race day, beating the rest of the team across the finish line. As he warned us: A natural athlete! Money raised was used to provide the Etse-Fewus ‘Healing Plants’ Association members with permaculture training at the Fiche garden in October. Botanica Ethiopia organised for Alex McCausland from the Strawberry Fields Eco Lodge in southern Ethiopia to conduct a five-day workshop on sustainable land management, which included techniques for soil improvement, bio-fertilizer production, natural pest control, water retention and seed-saving. You can READ HERE how the group is now using permaculture to manage an organic medicinal herb garden that is truly flourishing! In February, the Rift plateau country around Fiche town is coloured with red aloe flowers and eucalypts. It was market Sunday, and after meeting Gule and Emayu for a raw meat lunch, we left the spices, tuktuks and sheep on the main street to see the Etse-Fewus Association’s ‘Healing Herbs’ garden on the escarpment behind town. It had been a year since we’d last visited. We saw bushes of orange marigold, wild rosemary and lemongrass. A guardhouse of mud-brick and grass, a concreted dam to capture water in the rainy season. Young Kosso trees and Yeferes Zeng were growing along the new fence lines. The Kosso will shelter the more delicate herbs from the wind and rain, and will one day be used to treat tapeworm infections. The Yeferes Zeng, Gule told us, is for headaches and ‘to protect the property’. The handgun on Gule’s belt? To keep thieves and hyenas away when he’s on night guard duty. “If people come in the night to steal even one herb, this is a big problem for us, we have worked so hard to collect these plants,” he explained. Like most of the Etse-Fewus Association men, Gule works on his farm plot or as a share cropper most days; he sleeps in the guardhouse heremost nights. Gule told us the next step is for Etse-Fewus is to link the project to market. The group want to be able to process and package the herbs themselves – as dried herbs, ointments and essential oils – to generate income. To do this, he explained, they’ll buy chickens to build the quality of the soil with manure. Some of the members will bring their private beehives to the communal garden to help pollinate the herbs and increase honey production for the group. They will work together to keep growing. Granny and the Yankers, aka Kristin and Erin, at the finish line. She did it! With a little help from her friends, Granny Emmie made it across the finish line and came THIRD in her age group. Being 89 was no deterrent to her determination or stamina. A little credit needs to go to her stalwart supporters Erin Semon and Kristin Gomes – the Granny Yankers who pushed Granny 9 km in the Bridge Run at the Blackmores Sydney Running Festival at quite a respectable speed. Granny was not convinced they were always going in the right direction but she maintained her equanimity and laughed most of the way. She is very proud of her medal, and the fact that she raised $600 to support the sustainability of traditional herbal medicine in Ethiopia. Emmie and the ‘Granny Yankers’ warm up! Lizzie’s 89-year-old mother has registered in the Blackmores Sydney Running Festival this weekend to raise money for Botanica Ethiopia. But she isn’t actually running! Two crazy Americans, Kristin Gomes and Erin Semon, are going to wheel Granny Emmie across the iconic Sydney Harbour Bridge and beyond: 9km of sweat and struggle, hopefully no tears, with Granny waving the Ethiopian flag. Calling themselves the ‘Granny Yankers‘, Kristin and Erin came up with the novel idea so that we can continue to support the group in Fiche to build a model traditional medicine garden. They are so nearly there – funds will go towards buying beekeeping hives to keep at the garden site. Help Emmie and the Granny Yankers cross the line on Sunday 22 Sept! Etse-Fewus (Healing Herbs) Association members are combining their resources to get the most out of land they were given by the Fiche local government last year. During a recent visit, committee members told Botanica Ethiopia they plan to establish a small honey-production operation alongside their medicinal herb plantation, and that they hope to share their project as a working demonstration garden for the whole community. 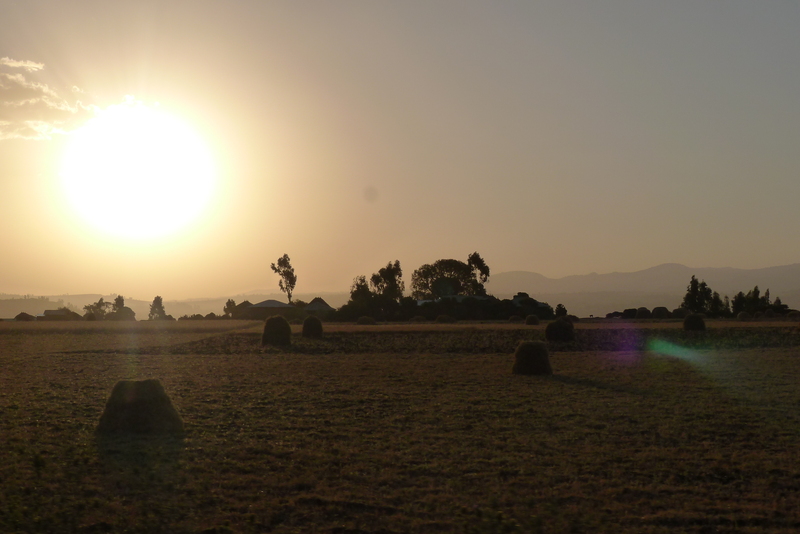 “After they got this land, what’s really important that has happened is that they’re planning a new way of thinking for their business and their lives,” says Tessema Bekele, Director of Ethiopian NGO Emmanuel Development Association and Liason Officer with Botanica Ethiopia. The fenced plot of land, almost the size of two Olympic pools, sits high above Fiche town on a sloped ridge of the Great Rift Valley. It’s flanked by thin young eucalypts and backs onto a rocky stream, which we’re told runs fast in the wet season. Bekele says the government gave priority to Etse-Fewus because it was so impressed with the group’s commitment and vision. “After September you will see a lot of change, you will see very productive land and all the herbs growing well,” says Etse-Fewus member Gule. “What surprises me is that we always underestimate the poor people. They lack chance but once you give them chance and some back-stopping support like Botanica Ethiopia has done, they are really very aggressive to think about their own affairs,” he says. Bekele sees his role in Fiche as helping to bring people together, and to listen. Botanica Ethiopia will continue to support Etse-Fewus to improve their land by facilitating permaculture and herbal conservation training for Association members.